One of my favorite things to do is make a craft, enjoy it for a while and take it apart and reuse the supplies, while adding new items for a different look. 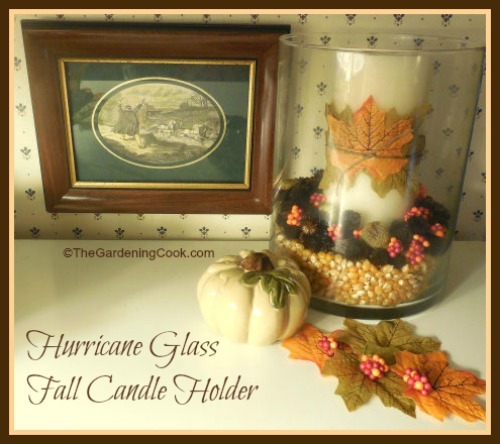 This fall candle holder is just such a project. Part of the supplies for the project came out of my scarecrow watering can planter, some came from a Candy Corn Fall decoration where I decided the candy was going to go stale, and a few were new supplies. 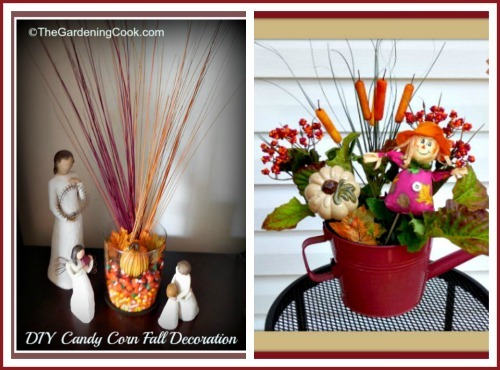 For another great looking fall centerpiece, check out these DIY succulent pumpkin planters. They are easy to make and look fabulous. 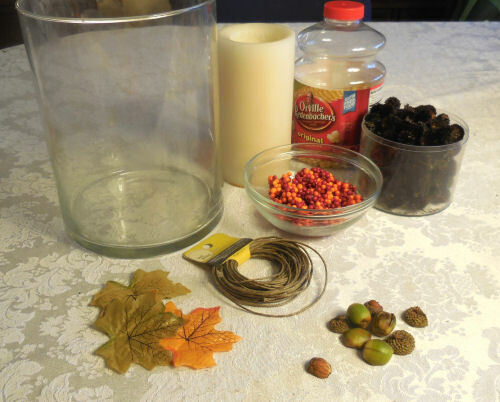 I originally wanted the candle to sit in some acorns and went out scouring the garden for some, but it is too early for them here in NC, so I only got a few. Instead of the acorns, I did find a whole bush of Black Eyed Susans which had gone to seed, so I chose those for the project and added a half jar of un-popped popcorn as well. A glass vase that I had once used to force bulbs. and some small plastic berries from a Dollar Store sprig that I used for my Scarecrow planter earlier this month. The first thing I had to do was make my candle. 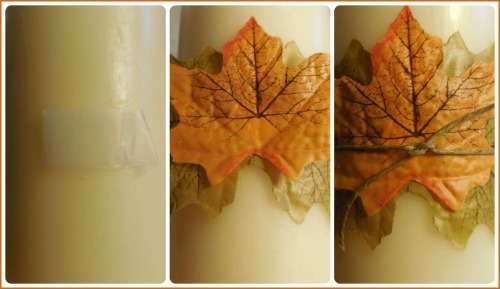 I placed a piece of scotch tape where I wanted the leaves and then place the leaves on it. One wrap with a short piece of jute and it was secured. 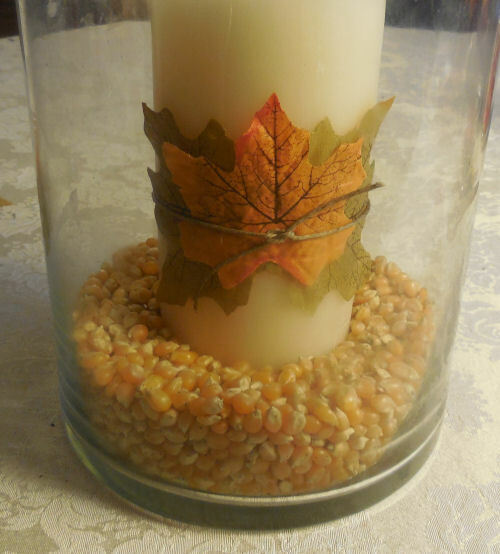 I placed the candle in the glass vase and poured in the popcorn. Later, I discovered that I needed more height, so I pulled up the candle so that it sat more on top of the popcorn, rather than in it. 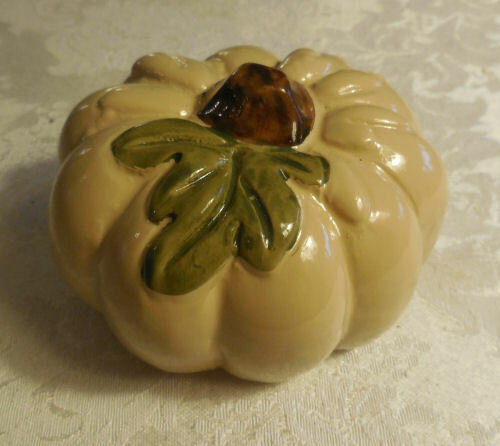 Next came the black eyed Susan centers, my few acorns and the plastic berries. I just sprinkled them in and used some tongs to position them where I wanted them. I decided it was too bare and needed something extra, so I used the Dollar store pumpkin, also from my Scarecrow project. That is all there is to it. Easy and cost me nothing since I had all the supplies from other projects. 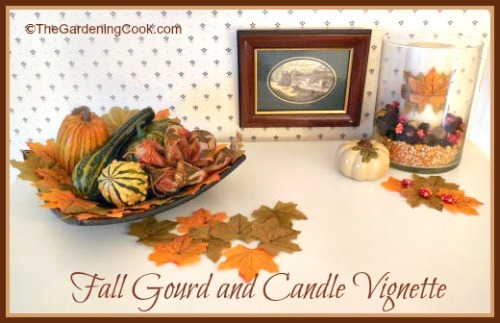 My Fall Vignette includes this project and my previous one for a Fall table Decoration with Gourds. They match so nicely that I place them together. It’s hard to believe the supplies for these two projects came from the ones in this picture isn’t it? 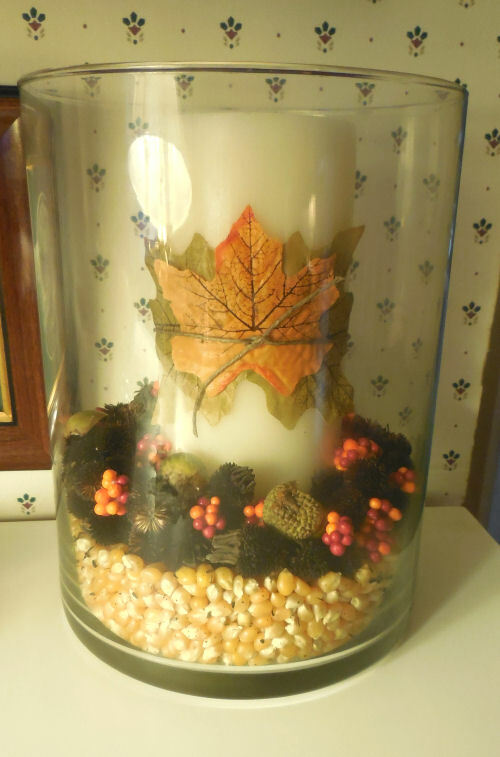 I also used popcorn and dried beans in another Hurricane Lamp Fall Centerpiece and love the way it turned out.